Baby it's cold outside – so warm up by the fire at the Lodge! Baby it’s cold outside – so warm up by the fire at the Lodge! Yes, fall is in the air – with winter falling soon behind. Time to think about cuddling with your partner in front of a nice warm fire with a glass of wine! Here at Eagle Rock Lodge we have a number of rooms that fit the bill! Our Dragonfly Room has a large wood burning fireplace – we supply you with plenty of wood (and even set up the first fire for you)! 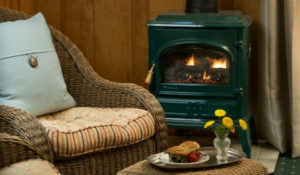 Our Songbird Room has a large gas fireplace – with the most comfortable loveseat in front of it! After relaxing by the fire, jump into the jetted tub to finish your day! Osprey, Owl and Mayfly Rooms have free standing gas fireplaces with remote controls! And, our lobby has a cozy free standing wood burning fireplace for all to enjoy! If the weather is nice, head outside in the evening and light a fire in our fire pit – right next to the McKenzie River! Don’t let the damp weather get you down – come and cuddle up at the Eagle Rock Lodge!